There as not been a whole lot of knitting going on of late. I have tried to put in a round or two on my socks every day because I am trying to hold on to my commitment to the Socks with Sarah KAL. 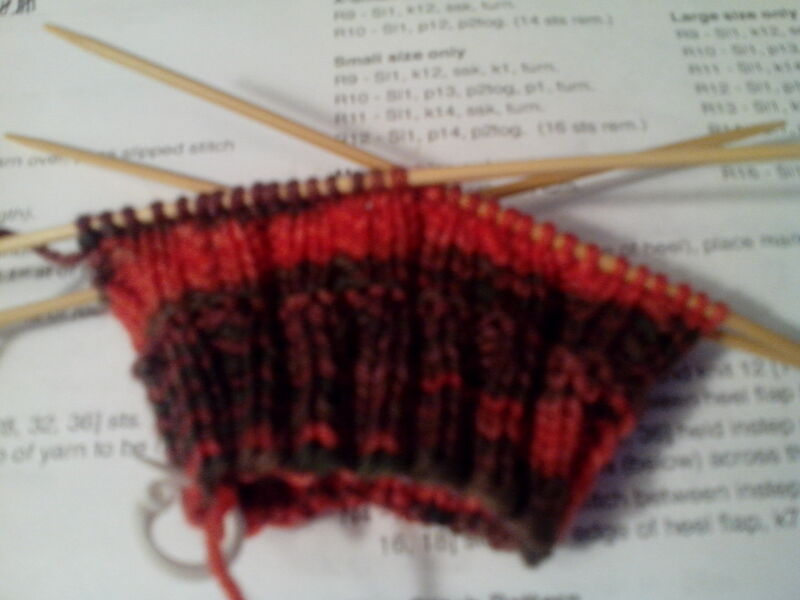 I have even had DS try on the green socks so that I know how much further to go on the foot before starting the toe. I am SO close to that toe. 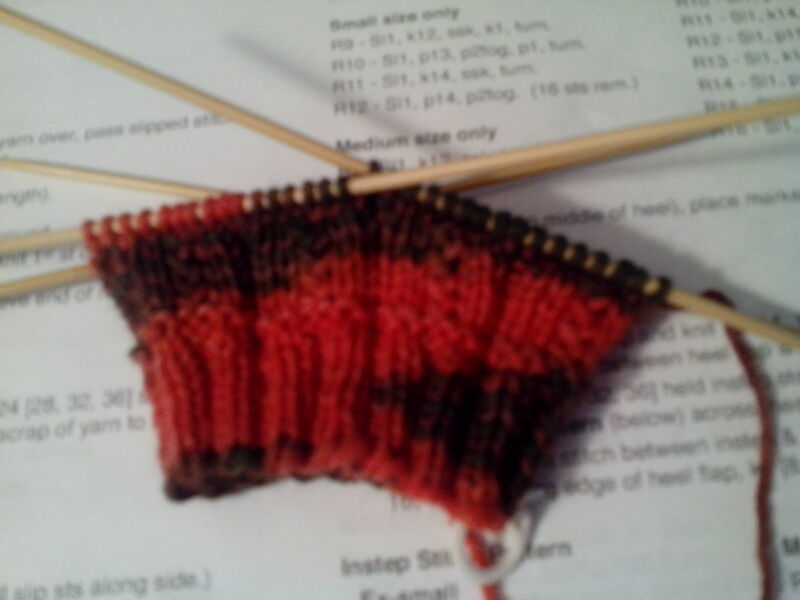 Thankfully the second sock will go much faster because I will have my notes. I am further down the leg of this sock and really liking how it is knitting up. I just need to get the camera out and take some pictures. If these fit, I hope to keep them for myself as a remembrance of DH’s hard work in making beautiful yarn. Because of my impending trip to see my dad, I have some other projects that I hope to cast on and slip into my suitcase. My focus will be on my dad and time with him, however I plan on taking the knitting to help me through this difficult visit. I will need to take pictures as I cast on and then decide how many of them I will take. Since I will only be gone four days, I don’t plan on taking very many. The reason for taking several is so if one doesn’t suit my time/mood, I can try another. Knitting helps me put things back into their proper place when my world isn’t quite right. I have found it to be really great therapy. I won’t say it is cheap because the yarn can sometimes cost a bit, but I really try not to go there. All of the projects I take will be fairly simple patterns so as not to task my brain. I am also taking one cross stitch project in its case. That is the needlecase that is one thread over one thread on 28-count evenweave. I honestly am not sure that I will get any done, but it is another option and hopefully will help me keep my perspective while spending as much time as possible with my dad and mom. On a totally different note, my washer decided that it didn’t want to spin out or cycle through any more. This was discovered when I went to do laundry on Wednesday. Because I desparately needed laundry, I went ahead and worked through all four loads and hand wrung each piece before putting into the dryer. Thursday after spending all of Wednesday afternoon searching for the purchase paperwork, etc., I placed a call to Lowe’s to see if we could have it looked at. We are pretty sure that we purchased the extended warranty, however they did not give us paperwork for it. Long story made short: They sent out a repairman Friday morning early to check it out as a courtesy call while they put a request in to obtain the details on the warranty. Since we purchased it 3 1/2 years ago, we are hoping that it will still fall under the four-year warranty program. The gentleman who came out ran some tests and determined that the tub seal broke and leaked water into the gear box. The gear box was ruined and a sensor that determines how fast the basket is spinning was so rusted over that it could no longer sense things properly. To replace the gear box would cost over $300 and the sensor plate would cost a bit over $100. He didn’t tell us how much the seal would cost. Since the washer cost us around $600 when we purchased it, we have to wait to see whether Lowe’s will want to have them order parts and try to repair it, or if they will replace it. All I know is that I hope they find the paperwork on the warranty because if it is decided that we need to replace it, we may be left to purchase another one. I may decide not to get another Maytag as it has not lasted very long at all. For now I can’t do any laundry until they decide what to do because of the leaking water and the electrical situation. So Sunday, DH, DD, and DS will take the laundry over to GPID’s in sorted baskets and wash it there. Then they will bring it back to be dried here as our dryer works just fine. We won’t know what Lowe’s decision is before Tuesday because of the holiday (Labor Day) and because all the paperwork has to go in and be looked over. I hope they don’t take too long as I really hate being without a washer. This entry was posted in Uncategorized and tagged cross stitch, knitting, laundry, Socks with Sarah KAL, washer. Bookmark the permalink.